is a discussion of the psychology that I feel  has helped my racing record. you on the starting line. bias, and generally get a feel for the early part of the race. miracle to put you in first. Usually on the first beat, one side of the course works out better than the other. If this happens in a big way, next time around most of the boats will go that way, regardless of whether the factor that caused that side to be good still exists or not. This, of course, allows you to go the other way with clear air and good odds of passing lots of boats if you've analyzed properly that the factor causing the one side to be good the first time no longer exists. and then go up, but more than half will not luff if you go high first-then whiz by. to have work. However, on the fourth attempt be more extreme and you'll probably make it. only one tack or give it four tries. 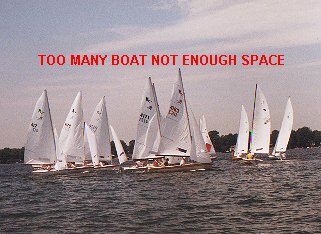 tolerate lots of tacks, let the challenging boat be slightly to weather and behind. he can outpoint you by footing slightly or just not pinching when this game starts. In other words, bait him into not tacking away. both of you relative to other boats. him and he tends to become more generous to you in his judgment of the overlap. miracle windshift, calm or storm does happen. as we crossed the finish line. if we both use the same "Psych".